What makes the run-up to this Ramadan significantly different from the last? The launch of the world’s first fully-featured Ramadan app that’s nothing short of revolutionary: Ramadan Legacy. Officially launched just three days ago, Ramadan Legacy would be best described as a productivity powerhouse geared with ingenious tools, options and resources to help Muslims maximize their time, energy and focus this Ramadan and make it their best yet, in sha Allah! To give you a closer look at Ramadan Legacy’s key features, ProductiveMuslim interviewed the app’s project lead, Shahbaz Mirza. 1. The name of your app sounds resplendent and reflects an expansive vision behind it. Tell us about the impact on global Muslim productivity your team envisions this app to have. The name Ramadan Legacy came through deep conversations that the team had on several occasions about our purpose in life and the importance we place on the elements, which compose our lifestyle. We believe that when you prioritize and make something important and expand it, your mind and heart place more importance on that particular responsibility. We created an app to allow Muslims across the world to produce their own vision for their life through allowing them to create an Imaan Blueprint for Ramadan and the rest of the year. 2. Give us a general overview of Ramadan Legacy: what are its key features that help users plan, prepare for and maximize their Ramadan? The App has an announcement and notification section, and developers have the ability to send regular reminders/suggestions for users to carry out certain actions throughout the day.Along with this, the app has a 30-day action plan with acts of worship to complete every day, saving considerable amounts of time by providing worshippers with a framework to follow throughout the month. It also allows you to set your own personal goals which are found on your Legacy Board, thus encouraging you to better manage your time in order to achieve them.Furthermore we have an online printable planner which provides an array of useful tips and tricks to manage time, for example, a simple breakdown on how to complete the Qur’an in 30 days. The app gives you a step by step guide and this is the most powerful feature within the app. Often in Ramadan, we have the time to learn about Islam and reflect upon it but sometimes we need a structure for learning. The step by step guide allows you to manage your learning, worshiping and reflecting and thus in turn helps you to organize your mind to achieve better focus and structure your daily routine in Ramadan. Included within the app’s Knowledge Library is a PDF by one of our partners “Be Healthy” who provide fantastic health tips to keep users on top of their nutrition game during the blessed month. This includes examples of foods to eat during suhoor and iftar, the type of foods to avoid and how to avoid getting thirsty while fasting. Our online printable planner also includes extra hints and tips, including a “Ramadan Survival Guide” explaining what to do if certain health problems occur. 4. What features does Ramadan Legacy offer to help users achieve the spiritual focus and goals they want to in Ramadan? The app begins by asking you what your top three goals are in Ramadan with suggested goals already provided for you. These goals can range from a spiritual goal such as reflecting upon yourself (muhasaba) each night or it can be a goal such as learning the 99 names of Allah or memorizing a certain chapter of the Qur’an. Within the app there is a very simple goal tracking system, which allows you to visually see whether your goal has been started, in progress or complete. In sha’Allah my first goal will be to memorise Surah Yasin, a goal that I have promised myself to smash for this Ramadan! 5. What type of reading material and beneficial resources does the app provide? 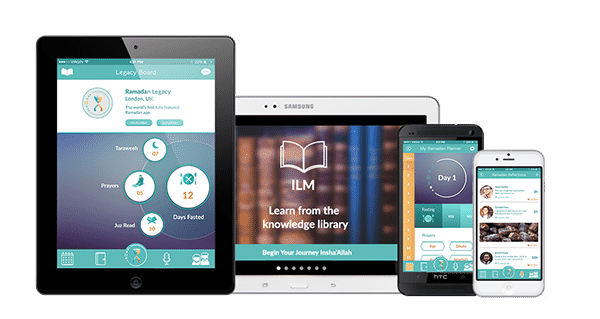 The app features a Knowledge Library, which is exactly what the name implies: a library of interactive and beautiful guides to guide you through Ramadan. 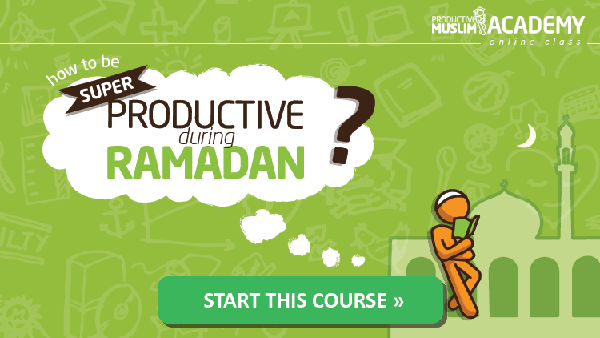 This includes guide topics such as: an introduction to Ramadan, how to be productive in Ramadan from Productive Muslim, calculating your Zakat, Ramadan stories and powerful duas (supplications) to recite in Ramadan. 6. I’ve read that the app allows users to record and share their Ramadan moments, which could end up being counter-productive at some point. How can users stay moderate in using this option and not end up being distracted by it? We thought you may ask this question! It is the number one question we are asked when presenting the app! Before the app was created we planned and strategized very well. We understood that Ramadan can’t be a time where we become distracted in activities which can essentially waste our time. The feature in the app which allows you to share your Ramadan experience is called Ramadan Reflections whereby individuals can post once a day, a reflection of their experience in Ramadan. This allows people to inspire each other, to experience what Ramadan is like in difference countries across the globe and to help Muslims in countries that may have a significantly reduced number of Muslims, feel part of a global family, hence being a Ramadan tool that will help maximize one’s time, energy and focus during Ramadan. 7. A lot of people tend to slack once they hit the middle of Ramadan, something we call the typical ‘mid-Ramadan slump’. Does the app offer anything to help people stay motivated in achieving their Ramadan goals? I am also a victim of this phenomenon! The app offers smart notifications to remind you of your worshiping activities that you should be doing in Ramadan. For example if you have not recorded in the app that you have read the Qur’an for a number of days, you will be reminded to read your Qur’an. If you have not attended Taraweeh or learnt the Ayah of the Day, then the app reminds you to perform your activities through clever motivational reminders. 8.What devices support the app and do you have an alternative version of Ramadan Legacy for those who want to stay away from their gadgets during Ramadan? The app is available in iOS and Android on all smartphones and available on the iPad and Android Tablets. There is also a printable version of the app called the Ramadan Action Plan Book which is available in English and French. Shahbaz Mirza is the mind behind Ramadan Legacy and the Ramadan Action Plan, having over 8 years of experience leading on local and international Islamic projects and creating leadership teams leading to the World Islamic Economic Forum. He has a passion for nurturing creative communities. Shahbaz is a Chartered Accountant with PwC by trade and a formal international athlete.